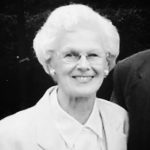 Grace Marie Krespan, also known as Penny to her friends, passed away peacefully at the Rouse Home in Youngsville, PA on Tuesday, May 8, 2018 where she had been a resident for over six years. She was born on April 6, 1925 in Johnstown, PA to John Charles and Iona Marie Pudliner. Following the sudden death of her father two years later, her mother married Carl Roosevelt Penrod, who adopted Grace. She was a graduate of Southmont High School and the Montefiore Hospital School of Nursing in Pittsburgh, PA. She married Lawrence Wesley Krespan on July 25, 1947 at the First Brethren Church, Johnstown, PA. Grace is survived by her loving and devoted husband of 70 years, Dr. Lawrence W. Krespan, daughters: Susan L. Mader (Clarence), Beth A. Burns, and sons: Lawrence P. Krespan (Linda) and Jon C. Krespan (Beth). She was also the loving grandmother of seven grandchildren: Bryan Mader (Melissa), Jennifer Rotz (Anthony), Jason Burns (Margaret), Ryan Burns (Kt), Nicole Olfini (Robert), Kyle Krespan and Erin Krespan and five great grandchildren: Carter Mader, Reece Mader, Jacob Burns, Ethan Burns and Gabriel Burns. She is also survived by her sister Bonnie Sue Penrod Harriman. Grace was active in her church, First Presbyterian Church, Warren, PA, where she was a member for over fifty years. She served as an Elder, chaired the Sharing Place for five years, and was a member of the Mariners class for over fifty years. She also volunteered as a nurse at Warren General Hospital and as a private duty nurse. She belonged to the Lions and Lioness clubs and the Order of Amaranth. She served on Home Street School’s PTA and founded and co-chaired the special gift committee for personalized gifts and wrapping for Warren State Hospital patients for thirty-seven years. Please accept my sincere condolences on Penny’s passing. I have always admired and respected your devotion to Penny, Larry.